Click Here To Download The FREE 3 Concepts To Play A 2-5-1 PDF! Welcome to part 1 of The Walking Bass Series! 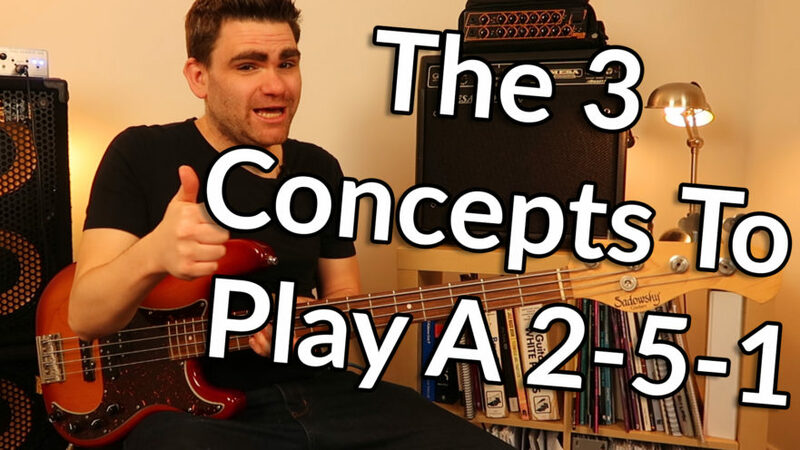 In this Bass Guitar Lesson I'm going to take you through the '3 Core Concepts' you can use to create Walking Bass Lines. To demonstrate this we are going to use one of the most important chord sequences you'll find in 'Jazz' music - The II-V-I (or 2-5-1). If you want to learn walking for bass guitar these 3 concepts will be pivotal for your understanding. Here is the II-V-I in the key of F which we will be using in this lesson. If you'd like to discover more about the construction of this chord sequence make sure you check out the lesson How To Play A 2-5-1. NOTE: For the purposes of this lesson we are using F7 chord. This could also be interchangeable with a F Major 7 (or F∆7) chord. As the name suggest the "Scalic Method" uses ideas derived from the Major Scale, Minor Scales & Chromatic Scale. It's an excellent way of creating 'strong' sounding walking bass lines because the scales lead the ear from chord to chord very clearly. At this stage of the game we always want to have a root note on beat 1 of every bar or chord change. This will mark the chord changes in the strongest way possible and give the rest of the band confidence. One of the challenges with using scales is there are often not enough notes in the scale to land directly on a root note, when the chord changes. Often you'll end up getting there one note early which does not create a strong sounding bass line. The Whole | Half | Half Method (or W.H.H. Method) is a brilliant way of filling in an extra note by adding a simple chromatic note. The construction is a Whole Step (2 frets), then two Half Steps (1 fret each). This will land us perfectly on beat one for each chord change. This concept works well when constructing bass lines that ascend over the 2-5-1 in the first two bars. Over the first two bars I've constructed a bass line that 'ascends'. To balance it out we're going to 'descend' over the last over bars 3 and 4. This will create a very natural 'flow' to the bass line. Descending is far simpler in this case because all we need to do is use a straight F7 scale, F Dominant Scale or F Mixolydian Scale (They are names for the same thing!). It gives us the perfect amount of notes. This line works so well because you have C which is the 5th of the chord on beat 1 of bar 4 and the Ab on the 4th beat leads chromatically back in to the Gm7. The W.H.H. Method also sounds great because it adds chromatic notes in to the bass lines. These chromatic notes are synonymous with the 'jazz sound'. Chord Tones are the 'building blocks' of each chord. They are the most important notes which 'spell out' the sound of the chord. Chord Tones are the Root (R), Third (3rd), Fifth (5th) and the Seventh (7th) of each chord. You may have also heard these called Arpeggios. Piano players and guitarists will generally create chords by playing all the chord tones together. As bass players we can create strong sounding walking bass lines by playing them one by one. Here is a bass line constructed using ascending Chord Tones in the first 3 bars and descending in the 4th. Now here's where things get interesting! Right now they sound like more of an exercise... but if you rearrange there order of the chord tones in the bar you can create some fantastic, natural sounding walking bass lines. The are many, many variations you could try using the idea of rearranging the chord tones. Try writing a few out! Once you internalise these ideas you'll effortlessly start creating walking bass lines that sound improvised and 'off the cuff'. The Chromatic Approach Method is all about 'approaching' the target note (or next chord) from either a half step (1 fret) above or a half step (1 fret) below. This is a simple concept which required very, very little music theory knowledge and also sounds great because chromatic notes are such a key part of the jazz or walking bass sound. A half step below is called a Lower Chromatic (L/C) and half step above is called an Upper Chromatic (U/C). Here's an example where we are just using a chromatic approach note on beat 4 of the bar to illustrate this concept. Let's move this on a stage so you can see where this idea can go. Here's is the II-V-I chord sequence played with another walking bass concept called a 'Two Feel'. As the name suggests a Two Feel consists of two notes per bar (as opposed to 4). The next stage is to fill beats 2 & 4 with either Upper or Lower chromatics. You can treat the 5th as a target notes as well as the root. Here's an example of this using a mixture of Lower & Upper chromatics. These are the 3 Core Walking Bass Concepts that make up the vast majority of all walking bass lines. The spontaneity and improvised nature of walking bass comes from varying the content of each approach AND mixing the approaches throughout tune. Look out for Part Two of the Walking Bass Series where I show you to build out the Scalic Approach Method over a much longer chord sequence. If you want to learning Walking Bass from the ground upwards make sure you check the eBassGuitar Essential Walking Bass Course in The Bass Lab PLUS Membership.